Project obstacles and solutions: Trinitas is a leader in student-housing construction. Their new Lux on Capital property is an 11 floor collegiate housing project that encompasses 370,000 square feet. It includes a five-level parking garage. The property will include retail space on the first floor, 193 residential units ranging from 1-4 bedroom suites that can house up to 669 people, a swimming pool, a courtyard area with grilling stations, a basketball court, a club house with a fitness center and gaming stations. The property stands just a few blocks from the IUPUI campus and is expected to attract college students who are looking for an upscale residence, but is conveniently located to both the campus and downtown Indianapolis. Trinitas served as their own construction manager and Midwest Constructors finished all of the concrete on the job. 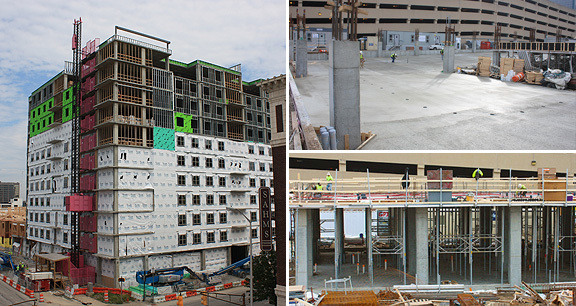 All of the floors on the tower and the parking garage were poured with post-tensioned reinforcement. Midwest Constructors pulled the tendons 24 hours after each floor was completed. IMI supplied a 6,000 psi floor mix for each of the decks that was required to gain early strength of 3,000 psi in 24 hours. The floors of the parking garage were required to gain a strength of 4,500 psi in 24 hours. Since the floors were poured over the better parts of three seasons, IMI QC/QA made adjustments to the mix to keep it within post-tensioned specifications. In the coldest temperatures, IMI accelerated the set time to meet these requirements. In the hottest temperatures, IMI adjusted the mix to keep it workable for the pump and finishing crews without compromising the strength. The Lux on Capital tower topped out in August 2016. The facility is expected to open to residence in the fall of 2017. IMI supplied 14,000 yards of concrete for this project. For more information on gaining early strength in concrete during temperature extremes, contact the sales representative for the concrete plant nearest your location. Click here.